As sociomicrobiology has advanced throughout the past decade, it has become clear that microbes cooperate with each other, collectively secreting antibiotics, degrading enzymes or protective exopolymers. We have also come to appreciate the complexity of microbial social interactions. For instance, during division of labour, subpopulations of microbes commit to different cooperative tasks resulting in advanced survival strategies, typically associated with higher organisms (e.g. development of fruiting bodies or complex migration patterns). As a research group with strong focus on bacterial biofilms, we were naturally interested in the impact of division of labor during biofilm development. Bacillus subtilis is a probiotic and plant-growth promoting bacterium that forms wrinkly pellicle biofilms on liquid-air interfaces and thick multilayer biofilms of plant roots. It’s biofilm matrix is mainly composed of exopolysaccharide (EPS) and amyloid fiber protein (TasA) which both are secreted and can be shared within the population. We wanted to examine productivity of biofilms established by a mixture of specialist strains, each supplying only one type of matrix component, EPS or TasA. A simple way to obtain such ‘specialists’ would be to use ΔtasA and ΔepsA-O mutants, serving as strict EPS- and TasA-producers, respectively. I started by reproducing a complementation assay between Δeps and ΔtasA strains. I was immediately overwhelmed by the exceptional robustness and wrinkleality of pellicles established by Δeps+ΔtasA mix suggesting that the two specialists were performing better than the wild type (WT). Shortly after the project kicked off, we were lucky to have Rolf Kümmerli for a seminar and brainstorm about the evolutionary insights of the study. Rolf suggested to examine how productivity of the mixed biofilms will change depending on different relative frequencies of Δeps and ΔtasA. 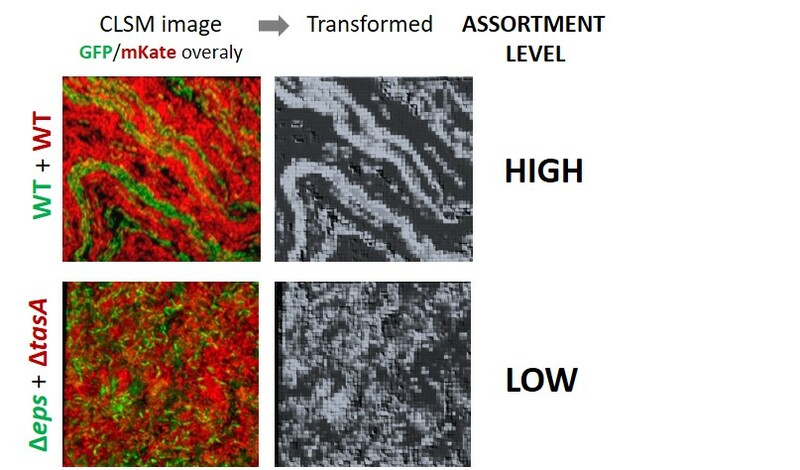 Through persistent exchange of emails and data files, we realized that coexistence of Δeps and ΔtasA in biofilms is stabilized by negative frequency dependent selection. We also learned that productivity of the mix peaks at ~30:70 ratio of Δeps:ΔtasA where it significantly exceeds productivity of the WT. 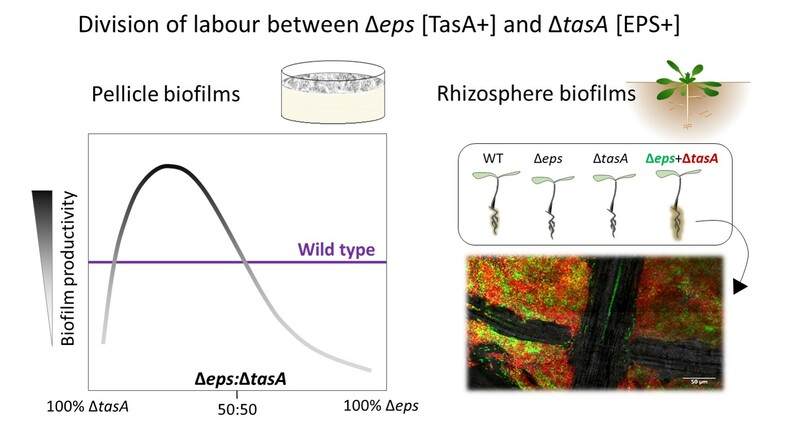 Moreover, division of labor between Δeps and ΔtasA appeared to work also during rhizosphere colonization of Arabidopsis thaliana plant. In parallel, we were curious to what extend the spontaneous differentiation into EPS and TasA-producers happens in the WT strain; especially as the mix of engineered specialists (Δeps and ΔtasA) exhibited improved biofilm productivity. 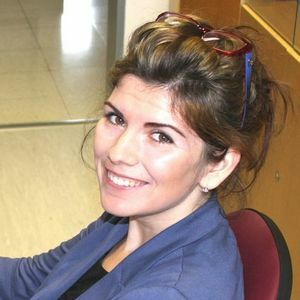 To push things forward, we contacted a colleague in the B. subtilis field, Nicola Stanley-Wall, on the possibility to examine single-cell level expression of eps and tasA in the WT strain. Nicola carried the double-labelled strain with GFP and mKate reporter fusions to eps and tasA promoters, respectively. Shortly after, Nicola and her PhD student Chih-Yu Hsu provided flow cytometry data on co-expression of both genes. They observed that the WT pellicles contained subpopulations of different types of matrix producers. The final goal was to understand why the genetic division of labour between Δeps and ΔtasA might be more productive strategy as compared to imperfect phenotypic differentiation observed in the WT. Individual based modeling performed by Rolf and Tobias Wechsler exposed key features of the division of labour system. Although efficient complementation between Δeps and ΔtasA depends of components sharing, modeling showed that increased diffusion rates have negative effects on productivity of the mix. Perhaps this explains an increased mixing of cell lineages in Δeps+ΔtasA pellicles, which is probably necessary for an efficient exchange of matrix components. Why the optimal Δeps:ΔtasA ratio contains majority of EPS-producer and minority of TasA-producers? Final experiments (inspired by reviewers’ suggestion) performed in collaboration with Susanne Brix and Carsten Eriksen (at DTU) showed an increased expression of tasA by the Δeps strain and slightly decreased expression of eps by ΔtasA strain. Modeling suggested that EPS provides higher relative benefit in biofilms as compared to TasA which could be due to its lower abundance. Anyhow, productivity of the Δeps+ΔtasA mix can easily be maximized by shifting the ratios towards higher frequency of more ‘valuable’ partner. Finally, benefits from metabolic decoupling of EPS and TasA production could explain increased productivity in the system with genetic division of labor. Overall, we were able to demonstrate that division of labour pays off in bacterial biofilms. Reassuringly, the project could also serve as a proof of principle for fruitful division of labour between multiple research labs.